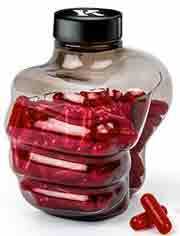 UK Based supplements manufacturers Roar Ambition has a lot to say about their Instant Knockout fat burning capsules. Helps you get the physique you need, whoever you are. Burn fat and get a fighting-fit physique. It’s like opening a box and taking out the packaging and there’s this great new body waiting for you. That’s some pretty fancy hype. The Instant Knockout formulation is going to have to pack a powerful punch to live up to claims like that, but we have to admit we were rather intrigued when we first heard there was a new fat burner with a fist shaped bottle. So we decided to take a closer look at Roar’s ambitious fat burner and see if the formulation could hold its own against such formidable marketing spiel. 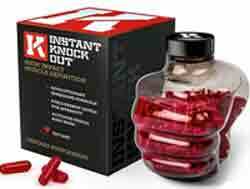 Instant Knockout is instantly recognisable with it’s fist shaped transparent bottle containing bright red pills. The macho branding should not put any potential women off, nor should it put of customers who are not a member of the bodybuilding or martial art fraternity. Instant Knockout is great for just about anyone wanting to burn body fat. What is Instant Knockout and how does it Work? 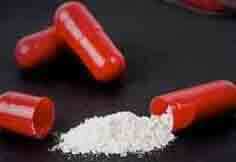 Instant knockout is a fat burning supplement produced in capsule form. The capsules contain a blend of 10 natural ingredients, several of which are known to be powerful fat burners. The capsules also contain a bulking agent (glucomannan), to provide appetite suppression; along with some caffeine to help pep things up a bit and provide a little extra energy. According to the manufacturer the formulation was originally created to help professional and amateur fighters shed unwanted body fat whenever a competition bout was imminent, but Roar are quick to state their formulation is suitable for anyone who wishes to ditch unwanted blubber and get a fit new look. If you are into bodybuilding or simple want to lose excess body fat then Instant Knockout is suitable for you. Burn body-fat (and start counting the notches on your stomach). Feel confident with your shirt off (at home, in the locker room or on a night out). Strip away the fat after bulking (and show your muscle off). We originally thought all of Roar’s hype may have been employed to distract attention away from an inferior blend, so it was pleasant surprise to discover such a powerful mix of ingredients. B vitamins are known to assist the metabolism, and vitamin B2 can be particularly useful because it can also help ensure thyroid health (thyroid hormones can assist the fat burning process). Zinc is also a valuable inclusion. It offers many benefits and is known to boost testosterone levels and help ensure lean muscle tissue. The main fat burners are chromium, green tea, green coffee bean, and cayenne. Chromium’s abilities are somewhat overrated, but the other three fat burning ingredients have proved their worth in several clinical studies. The cayenne content alone has the potential to help the body burn calories at 12 times its normal speed. Glucomannan is a natural fibre that has the ability to expand in the stomach and make it feel full. It’s an increasingly popular appetite suppressing ingredient these days and, more importantly; it has been clinically proven to work. Caffeine has obviously been included to boost energy levels, but it should also help improve concentration and focus. The last ingredient, black pepper, contains an alkaloid that can help ease the absorption of other ingredients and is also an effective fat burner in its own right. Roar recommends leaving around three hours between each dose. They state this schedule will encourage more consistent fat burning benefits. This makes perfect sense to us, and it seems likely that any user using the capsules in the advised manner should see some very good fat burning results. Instant Knockout contains caffeine, so there is a possibility some users may experience caffeine related sided effects such as restlessness, jitters, or nausea, but any user who can normally tolerate a cup of coffee is unlikely to have anything to worry about. Instant Knockout is not recommended for pregnant or nursing mothers or anyone who has existing health problems. Despite our initial reservations, Instant Knockout succeeded in knocking us sideways—we are impressed. Instant Knockout is competitively priced and Roar shows enough faith in the product to back up their sales pitch with a lengthy money back guarantee. We have to say we share their faith; Instant Knockout is an instant winner as far as we are concerned and an easy addition to our list of recommended products. Instant Knockout capsules can only be purchased from the official website, but international shipping is available and all purchases are protected by a 90 day money back guarantee. 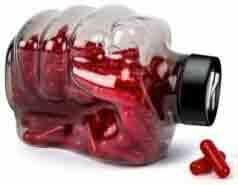 Expect to pay around £35 for a month’s supply of capsules.